PomoNews.com: (VIDEO) YELLOW VESTS REVOLT: REMEMBER THE MACRON LEAKS? May 8, 2017 Infowars' Alex Jones talks to Jack Posobiec about the #MacronLeaks. May 8, 2017 Jack Posobiec is being sued by now French President Emmanuel Macron, the ultimate badge of honor. 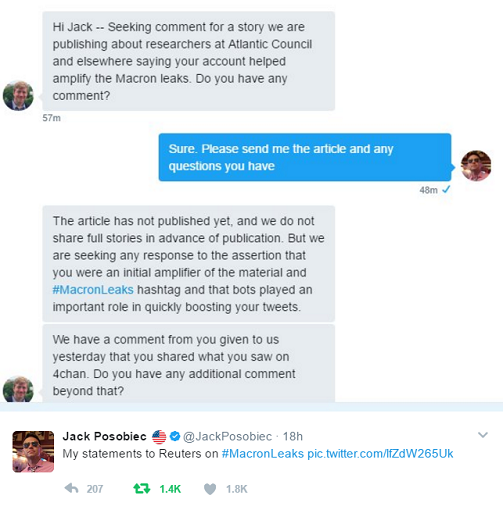 After 9 gigabytes of Macron-linked documents and emails were released on an anonymous pastebin website on Friday afternoon in what Macron's campaign said was a "massive and coordinated" hacking attack, macrooners have been warning it would be a "criminal offense" to republish the data, and warning the French media not to publish content from any of the hacked emails. 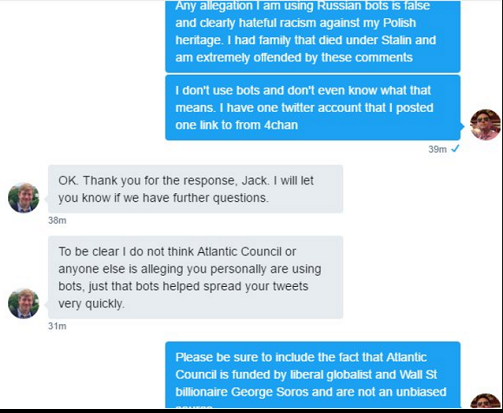 As one who broke the MacronLeaks early in the US and Canada, Jack Posobiec was threatened with law suits. An editors of present blog was suspended by Twitter for upto 24 hours due to automated behavior. All the intimidation hasn't stopped Wikileaks from verifying 21,000 documents out of the total dump of 9 gigabytes. We have now positively verified slightly over 21 thousand #MacronLeaks documents and our analysis on provenance continues to develop. May 6, 2017 Eric Duhaime at The Rebel: Secret Islamization Plans. Just one day before the French election, a massive pile of documents were released about the left-wing candidate Emmanuel Macron. Eric Duhaime went through the documents and found Macron's secret plan to Islamize France. Watch to find out what's inside Macron's plans for joining Islam with France. (More) At 7pm local time only 65,3 percent of the voters had gone to the polls. In 2012 the tally stood at 75 percent. Really? How is that different from Barack Obama's high profile endorsement of his mate Macron and Ann Applebaum's call to associate Le Pen with Trump in order to throw the election to Macron? Pathetic! Ezra Levant, the proprietor of The Rebel Media explains. 10 avril 17 @EmmanuelMacron s'attaque au chiffrement. 5 mai 17 #MacronLeaks 9 Go disséminés, faute de chiffrement. As Wikileaks has warned, this leak is coming a bit late in the day to have much influence on the result. France is one of those countries that prohibits campaigning 24 hours prior to the election. Citizens can look forward to a fine of EUR 3750 if they dare post to Twitter or Facebook. That means that the information will be contained to the mainstream media that are sticking to the talking points that Macron is a "victim of massive hacking" and that "the Russians" are once again lurking behind this. These people are clueless what they're talking about. This isn't about hacking, it's leaking of information! Apparently this game never gets tired. But should Macron win the elections, all this tax evasion and bigotry will come out. How much moral authority will this President have? Not much. But that doesn't matter. He is a stooge for globalist interests. A figure head. A sock puppet. The global elites will move his hands behind the curtain. The Left is now actively supporting Neo Liberalists and Globalists against Liberty and Democracy. Let that sink in! For the sake of good order, we do not view paying taxes as a virtue. Taxes are evil, but admittedly unavoidable upto a point. But the less taxes we have to pay, the better. Also, legal tax avoidance (not paying the taxes you don't have to) is perfectly fine as a principle of liberty. What we do object to, is double standards. One rule for the people, another for the globalist elite! If globalism is about one thing, it is about stamping out tax competition between countries, resulting in money flowing to the most free places. But Mr Macron the bigot, hid his nest egg in the Cayman islands. Hypocrisy is the problem here! MacronGate is not about taxes, it's about equality before the law. Evelyn Farkas, the woman in the State Dept. who illegally helped spread classified information on private American citizens all over the Deep State, already knows the culprit: IT'S THE DARNED RUSSIANS ALL OVER AGAIN! Berlin and London must be terrified! Wikileaks has the archives now available as uncensorable magnet links. The stormy river of the #MarcronGate has burst its banks. The Macron campaign just put out a press release admitting a "massive and coordinated hacking attempt", except it wasn't a hacking but a leak in his inner circle, and not an attempt but an actual document dump indicating tax evasion (which to the Left is worse than actual tax fraud). Following Reuters, the mainstream media will now have to break the story. 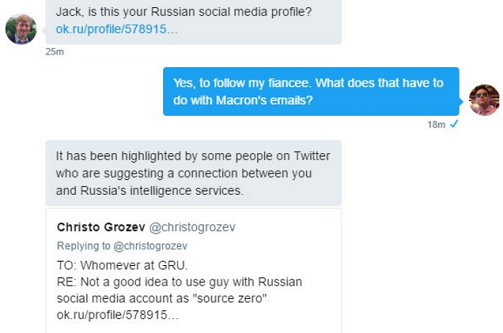 The Macrons are already playing the victim card, pointing the finger at...you guessed it, the Russians. Wikileaks is lending its expertise to the analysis. Twitter France is finally trending the topic. But not for long! Here's the reason the Macron campaign waited until now to admit the leak: tonight in France after midnight, a Tweet or Facebook post about your candidate can cost you 3750 EUR! All campaigning is prohibited 24 hours prior to the election. /pol/ has just become the new Wikileaks by a massive doc dump at /pol/ of correspondence, documents, and photos from Macron and his team, links to torrents of emails between Macron, his team and other officials, politicians as well as original documents and photos. The leak is massive and released in the hopes that the human search engine will be able to start sifting through the contents and figure out exactly what we have here. This was verified by people at THOTCON hacking conference, currently going on in Chicago. So intrepid cyber sleuths, have at it! GotNews.com had an auditor to confirm the authenticity of the documents linked to Emmanuel Macron and La Providence LLC (which also happens to be the name of the high schook where he met his wife). The auditor's findings conclude with the recommendation that the French government obtains a warrant to conduct further investigations into Emmanuel Macron’s financial activities. (More) A few key points from the audit. From June 10, 2014 to August 26, 2014 Emmanuel Macron was out of Government. During that period, press reports claim that Emmanuel Macron was setting up a Finance Consulting Firm, an education-focused Venture Capital Fund, and was a guest Professor. If the payments were for any of these activities, which occurred in France and Germany, then Macron should be charged with tax evasion. Are these payments for his actions as Minister of the Economy? This date also, falls just after the controversial Alstom-GE deal. As Minister of the Economy, Emmanuel Macron reversed the position of his predecessor who opposed the deal. Macron refused to carry out earlier policy directives regarding the deal and gave his signature to allow the deal to happen on 4 November 2014. The deal was finalized on December 22, 2014. The successful completion of the deal resulted in Alstom paying 30 million euros in bonuses to their top executives. If the cheques sent to La Providence Ltd. were issued directly on indirectly by Alstom, GE, or their executives or shareholders, then Emmanuel Macron should be charged with tax evasion and corruption. Anon explains why these documents leaked about Macron are so damning. /pol/ is getting closer to blowing the #MacronGate scandal wide open. Anon explains how Macron may be funded, in-part, by the US Deep State using the usual channels for corruption. My sources in #Brussels tell me Macron's victory in the #Frenchelections is seen by the EU leaders as a done deal. CAN MARINE LE PEN DEFEAT THE GLOBALISTS? Apr 24, 2017 Inforwars: Paul Joseph Watson talks with FN candidate Tony Thommes @tonythommes. FRENCH SHOCK POLL: 54% of French voters want a referendum on EU. Le Pen is offering vote. Macron is not.